Our planet’s water shortage is a reality for one in five people worldwide, but enough precipitation falls annually to provide ample water for everybody. We simply have to collect, store, distribute, and reuse a small percentage of that which falls from the sky. Fortunately, this way of saving the world comes with perks such as increasing your property’s value, lowering your utility bills, or simply creating a comfortable oasis for scintillating conversation just outside the kitchen door. Harvest the Rain presents a wealth of opportunities for enriching your life. Now that you've found this book, you can reap the benefits and ensure that future generations inherit a better world. — Nick Paumgarten, staff writer, The New Yorker. Harvest the Rain is the book I have been waiting for: a detailed "how to" for people and communities wanting to take a major step in saving the world's water written by a passionate water conservation advocate. Let this practical, entertaining and challenging book be your guide to your own — and the world's water secure future. to the President of the United Nations General Assembly. This book will not only make you a true believer in the regenerative power of harvesting rain — it will show you how. Harvest the Rain is full of practical solutions to our water shortages and points the way to a climate-resilient future. If we want thriving landscapes, abundant food, strong communities, and sustainable economies, we can start by treasuring rain. —Andy Lipkis, Founder and President of TreePeople and Ashoka Fellow. Harvest the Rain is not just another true horror story about impending environmental apocalypse. Nor is it a dry how-to book about water use. Downey makes us feel the reverence that cultures throughout human history have felt for water falling from the sky. and Professor of Classics at the University of Texas, Austin). Harvest the Rain is a harmony of a passionate heart, a practical mind, and a spirit that communicates luminously. more than 20 other books about language. The pleasures (and necessity) of cooking and eating are entirely dependent on water anywhere, but in dry regions like ours, the matter of water is an increasingly urgent concern. Harvest the Rain is an eloquent testimony to the necessity of taking local water seriously and learning to understand, harvest and use it — important to read and more important to implement! —Deborah Madison, author of Vegetable Literacy (and so much more!). With an engaging voice, practical advice, and true depth of knowledge Nate Downey offers real solutions to those who want to take control of their own water supply. Harvest the Rain should be required reading for anyone concerned about the future of water in this country. —Carleen Madigan, author of The Backyard Homestead. We as a species, of course, have to figure out how to live within our water means even as we transition from fossil fuels for our energy. Harvest the Rain is a great guide for individuals to learn how to succeed at that crucial task. —Doug Fine, author of Farewell, My Subaru. Harvest the Rain is a vital wake up call to a healthier, more sustainable path available to us all. As Nate exclaims, “Look! Up in the Sky! It’s not a bird, a dog, or even a plane. It’s rain!” Harvest it, as this book recommends, and precipitation becomes power. —Brad Lancaster, author of Rainwater Harvesting for Drylands and Beyond. Harvest the Rain is a new and optimistic look at our current issues concerning a vital resource — fresh water — and the urgent need to capture, conserve, recycle, and protect it in the face of the ferocious demands of this century. The book is practical, thoughtful, and passionate. —Baker H. Morrow, FASLA, author of A Dictionary of Landscape Architecture. Downey writes with a captivating style ... with intelligent enthusiasm about what average homeowners can do ... Readers will find his book ... hard to put down. He stresses the gains of green gardening, such as beauty, shade, privacy, wind protection, and the joys of gardening provides to families and neighborhoods." The Texas Observer: Killing the Thirst. Times Higher Education: Look for review at bottom of this link. 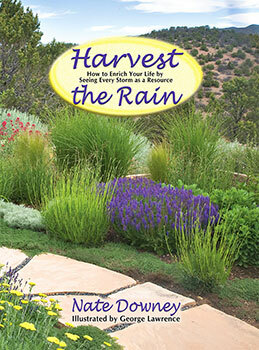 Santa Fe New Mexican: Landscaper hopes book will help rain harvesting take root. Santa Fe Reporter: Come Again Another Day. Tim Fowler on Ecodaddy.com: In Just Ten Minutes a Day. TR Knoblauch on EcoVersity.com: Recent Books of Note. 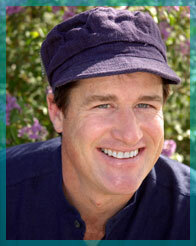 For 15 years, Nate Downey has written a popular monthly column called "Permaculture in Practice" for The Santa Fe New Mexican’s award-winning ‘Real Estate Guide.’ A frequent guest on public radio, a perennial presenter at green events, and the author of two books on water and sustainability, Nate is a seasoned teacher, speaker, writer, and businessman. Soon after he started Santa Fe Permaculture in 1992, Nate’s wife, Melissa McDonald, joined his forward-thinking landscape-design firm. Since then, their beautiful, functional, and ecological projects have popped up regularly in prominent publications from Su Casa to Sunset. With their two boys, Nate and Melissa share a backyard brimming with bees, bunnies, chickens, all sorts of edible plants, lots of harvested rain, and a nice little patio for building community.